Since it is my first Christmas away from my family on the west coast, I decided that I would cook dinner for my husband and my mother-in-law. I scoured various recipes to try and find the “perfect” main course, and then remembered I had seen this pork loin recipe in one of my emails from thenest.com. 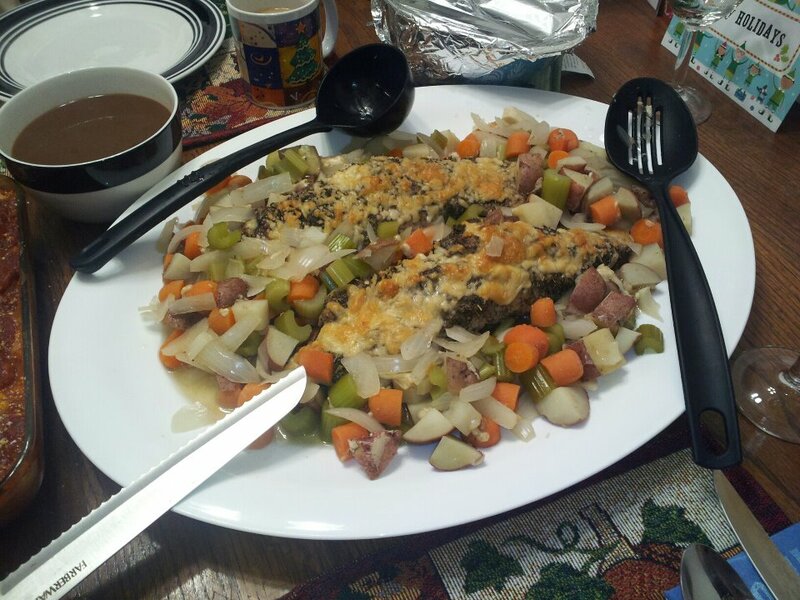 We had other side dishes as well, but this is a great meal–includes meat, veggies, and potatoes, so it’s a fantastic “one-pot dinner.” Be warned: this is enough food to feed a small army…it fed the 3 of us and created about 5 days of leftovers. -Arrange the potatoes, onion, celery, and carrots in a large roasting pan. Pour the broth and sherry over them. Season the pork all over with salt and pepper and sprinkle with the sage and garlic-and-herb seasoning. Place the pork on top of the vegetables and sprinkle with the Parmesan (press the cheese into the meat). Roast until an instant-read thermometer inserted into the thickest part registers 160°F, about 45 minutes. -Let the pork rest for 10 minutes, then cut crosswise into 1⁄2-inch-thick slices and serve with the vegetables and brothy sauce.